"I am extremely happy to be facing Floyd Mayweather because it will give me the opportunity to show the world that I am the best welterweight in the division," said Marcos Maidana. Floyd Mayweather Jr. gave himself a 37th birthday present Monday, confirming he’ll collect another multimillion-dollar purse by selecting Marcos Maidana as his May 3 opponent. Mayweather (45-0, 26 knockouts) will defend his World Boxing Council welterweight title on Showtime pay-per-view at a site to be determined, either MGM Grand or Brooklyn’s Barclays Center. "I am extremely happy to be facing Floyd Mayweather because it will give me the opportunity to show the world that I am the best welterweight in the division," said Maidana, who will represent throngs of Latino boxing fans on Cinco de Mayo when he faces the pound-for-pound king. "I just handed a great defensive fighter his first loss and I plan to do the same to Mayweather. I don’t care whether he’s the best and undefeated. I will bring some real Latino power to him on May 3rd." Maidana boasts an 82 percent knockout rate. "Marcos Maidana’s last performance immediately brought him to my attention," said Mayweather. "He is an extremely skilled fighter who brings knockout danger to the ring. I think this is a great fight for me and he deserves the opportunity to see if he can do what 45 others have tried to do before him — beat me." "We’re ready to go," Mayweather advisor Leonard Ellerbe said. "Maidana’s a terrific fighter, a devastating knockout puncher. It’s a very dangerous fight. He’s a guy that people have overlooked in the past. Floyd has got to be at his best." In September, Mayweather cruised to a majority decision victory over WBC junior-middleweight champion Mexico’s Saul "Canelo" Alvarez, as the fighters generated a record $150 million in pay-per-view sales. Ellerbe said although Maidana, like "Canelo," relies on power punching to win, Mayweather is anticipating a different, more entertaining fight this time. Thanks a lot to everybody who supported me around the world! I'll give it all to give you a victory on May 3rd! "Maidana’s never in a bad fight," Ellerbe said. "We know that from the opening bell, he’ll try to knock Floyd’s head off. He’s nonstop, relentless, can punch with either hand. He won’t let Floyd breathe." Maidana is expected to resume training in Oxnard under trainer Robert Garcia. Ellerbe said he expects to finalize site negotiations "later in the week." Mayweather has fought at MGM Grand the past eight fights, but an arena official said there’s no agreement in place yet. Late last year, it became evident Mayweather was setting his sights on England’s Amir Khan as his next opponent when the Brit backed off negotiations to fight Devon Alexander in December. But that choice fueled criticism Khan (28-3, 19 KOs) was undeserving, given that the 27-year-old lost two of his last four fights and was knocked down in the fourth round of his April fight against veteran Coachella Valley fighter Julio Diaz in a bout Khan won by decision. 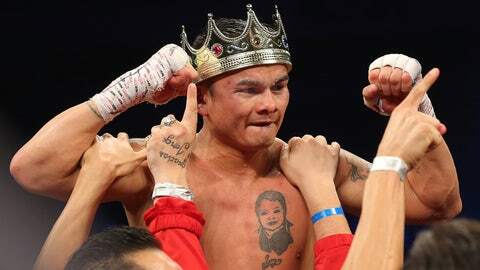 The 30-year-old Maidana (35-3, 31 knockouts) gained traction after winning the World Boxing Assn. welterweight title by knocking down then-unbeaten Adrien Broner twice en route to a unanimous-decision triumph Dec. 14 in San Antonio. Broner, managed by Mayweather’s manager, Al Haymon, agreed to a rematch, but then Mayweather put Maidana in consideration for himself. Argentina’s Maidana also dominated Riverside’s Josesito Lopez in June, mercilessly knocking him out at StubHub Center in Carson. Mayweather opted to put the choice to a fansâ poll, and Maidana jumped out to an early lead before being passed by Khan, who "won" with 57 percent of the vote. But Khan, who beat Maidana by decision in December 2010, grew frustrated last week at Mayweather’s delayed commitment, saying on his Twitter account, "No response from Mayweather or his team. Fight’s not happening." "Good luck to Maidana against Mayweather … should have taken the title fight last December against Alexander." "Amir Khan is a terrific, young fighter," said Ellerbe, who added that Mayweather’s actual interest in fighting Khan was "media speculation that comes with the territory." Some projected Khan’s hand and foot speed posed greater danger for Mayweather than another knockout-obsessed banger who can’t keep up with the rapid-moving Mayweather. After all, if the far-lesser boxer Alexander badly beat Maidana by decision in February 2012, how should Mayweather expect to fare? Yet, Ellerbe argues there’s not a better opponent possible for Mayweather. "Tough as nails," Ellerbe said. "A killer." Still, the fact that Khan was in the mix is further proof of the watered-down choices Mayweather has as a result of the ongoing feud between Golden Boy Promotions, which has assisted in the promotion of each of his fights since De La Hoya, and Top Rank, chaired by Mayweatherâs former promoter and now bitter enemy, Bob Arum. Manny Pacquiao is a Top Rank fighter, as is unbeaten World Boxing Organization welterweight champion Timothy Bradley. Pacquiao responded to a December 2012 knockout loss with a sharp boxing display in beating Brandon Rios in November, a month after Bradley did the same in edging Juan Manuel Marquez by split decision. Yet, Mayweather’s most significant acknowledgment of Pacquiao was chiding him for apparently begging for a meeting now that heâd recently lost and been beset by tax troubles. Bradley was more thoroughly ignored. Mayweather has said he’ll fight four more times, counting the May 3 date, and retire following the sixth bout in his contract with Showtime in September 2015.